We all know the clear and undeniable truth: dogs are the best friends of humankind. The lists of reasons are too many to count and even attempting to list them all would crash not only the site you’re looking at but probably the entire Internet. Now, maybe if we took down a few cat videos, we’d have a chance… but we’ve pretty much accepted that the felines dominate the Web. Fortunately, that leaves the pups plenty of space to be the cuddliest of best buddies out there. But, despite their amazing traits, there is one other entity out there that keeps us all wagging our proverbial tails even more! We, of course, are speaking of the patron of the Christmas spirit, good ole Saint Nicholas. Santa Claus not only loves all kindly folks but has some pretty epic magical powers and brings us presents! For the rest of the year, the pooch is our precious, but come those winter months, Santa tends to take the focus. Fortunately, we’ve com up with a way to blend both into one entity of pure joy. 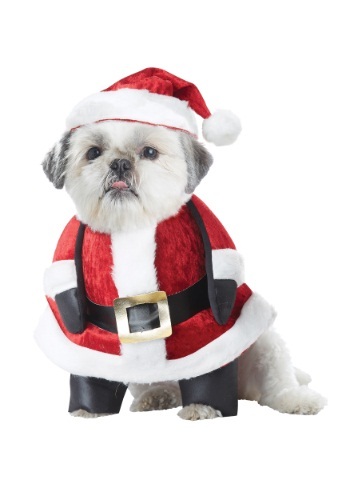 You can bring that perfect festivity to your own home with this Santa Pup Dog costume. Your pup’s front legs fit into the fabric Santa booties and the velour hat and coat make for a seamless transformation. Celebrate year round—or at least as long as the pupper will tolerate!